A small dog who shall remain nameless woke us up quite early this morning, so Lunch Guy and I made the best of the situation by heading over to Red’s for breakfast. 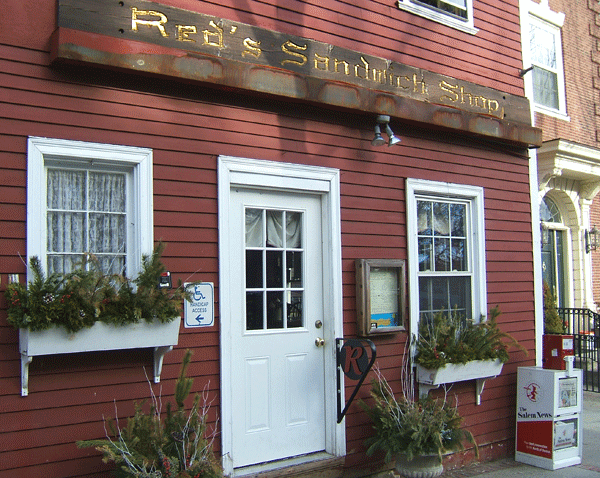 For those not familiar, Red’s is an old-style family restaurant with great food at terrific prices. It’s located on a small side street in Salem, but there’s plenty of parking nearby. Especially at 7:30 in the morning. Feeling the need for carbs, I ordered blueberry pancakes. The waitress asked if I wanted one, two, or three pancakes, saying they were large. She wasn’t kidding. I ordered two ($5), but since they are as big as a platter, one would have been sufficient. The blueberries were small and tender, and the pancake was fluffy. Lunch Guy was very pleased with his western omelette ($6), which came with a generous portion of delicious home fries and toast. He enjoyed his side of sausages ($2.50), although they were a bit mild for his taste. The bottomless cup of coffee ($1.75) was topped off so frequently he never came close to reaching the bottom. That kind of service holds true for lunch, according to Lunch Guy. In fact, the American Chop Suey at Red’s ($6.50) is one of his favorite lunches. Hot, delicious, and served quickly, the portion is so large he often can’t finish it. And there are plenty of other choices on the large and varied lunch menu, all at extremely reasonable prices.